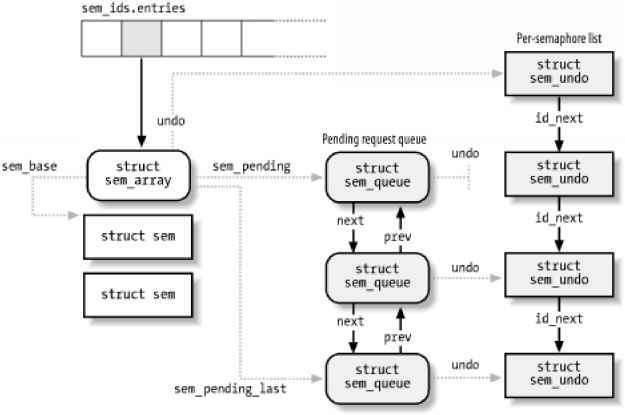 Formally, the array stores pointers to kern_ipc_perm data structures, but each structure is simply the first field of the sem_array data structure. All fields of the sem_array data structure are shown in Table 19-9. The value of the semaphore's counter. The PID of the last process that accessed the semaphore. This value can be queried by a process through the semctl( ) wrapper function. If a process aborts suddenly, it cannot undo the operations that it started (for instance, release the semaphores it reserved); so by declaring them undoable, the process lets the kernel return the semaphores to a consistent state and allow other processes to proceed. Processes can request undoable operations by specifying the SEM UNDO flag in the semop( ) function. Information to help the kernel reverse the undoable operations performed by a given process on a given IPC semaphore resource is stored in a sem_undo data structure. It essentially contains the IPC identifier of the semaphore and an array of integers representing the changes to the primitive semaphore's values caused by all undoable operations performed by the process. A simple example can illustrate how such sem_undo elements are used. Consider a process that uses an IPC semaphore resource containing four primitive semaphores. Suppose that it invokes the semop( ) function to increment the first counter by 1 and decrement the second by 2. If it specifies the sem_undo flag, the integer in the first array element in the sem_undo data structure is decremented by 1, the integer in the second element is incremented by 2, and the other two integers are left unchanged. Further undoable operations on the IPC semaphore performed by the same process change the integers stored in the sem_undo structure accordingly. When the process exits, any nonzero value in that array corresponds to one or more unbalanced operations on the corresponding primitive semaphore; the kernel reverses these operations, simply adding the nonzero value to the corresponding semaphore's counter. In other words, the changes made by the aborted process are backed out while the changes made by other processes are still reflected in the state of the semaphores. For each process, the kernel keeps track of all semaphore resources handled with undoable operations so that it can roll them back if the process unexpectedly exits. Furthermore, for each semaphore, the kernel has to keep track of all its sem_undo structures so it can quickly access them whenever a process uses semctl( ) to force an explicit value into a primitive semaphore's counter or to destroy an IPC semaphore resource. 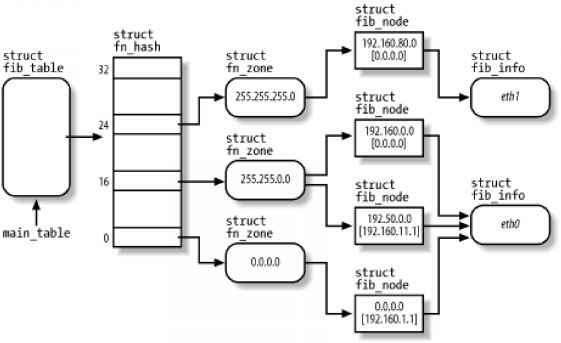 • The per-process list includes all sem_undo data structures corresponding to IPC semaphores on which the process has performed undoable operations. The semundo field of the process descriptor points to the first element of the list, while the proc_next field of each sem_undo data structure points to the next element in the list. • The per-semaphore list includes all sem_undo data structures corresponding to the processes that performed undoable operations on the semaphore. The undo field of the semid_ds data structure points to the first element of the list, while the id_next field of each sem_undo data structure points to the next element in the list.